Acer has updated its Z5710 and Z5700 All-in-one touchscreen PCs, bringing in the latest Intel Core i7, i5 and i3 processors. With All-in-ones one of the boom areas for PCs, Acer is keen to keep its range up to date – and has introduced the new Acer Aspire Z5710 and Z5700s. 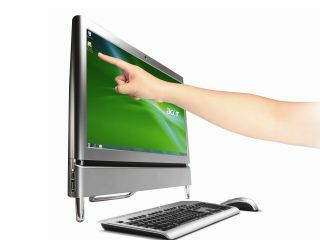 The All-in-ones are based around a 16:9, 23-inch multitouch display, backed up with Windows 7 and a host of Acer 'Touchgadgets' including a browser and media utilities. "Besides being a fun and engaging way for everyone to manage and share digital content, multi-touch technology means you can use more gesture combinations for a wider range of functionalities and a more natural and intuitive approach," says Acer. "With simple touches you can flick, rotate, magnify and more, making the experience faster, more instinctive and just plain fun!" Specs wise, you can have up to 2TB of storage, up to Intel's Core i7 processor and up to 8GB of DDR3 RAM. The Acer Aspire Z5710 and Z5700 have a UK release 1 August, with pricing yet to be confirmed.